WASHINGTON (CNS) — After returning from a Holy Week pastoral visit to U.S. troops in Afghanistan, the head of the U.S. Archdiocese for the Military Services said it was “deeply moving” to spend time “with that portion of my flock which is serving the cause of peace and development” in that country. 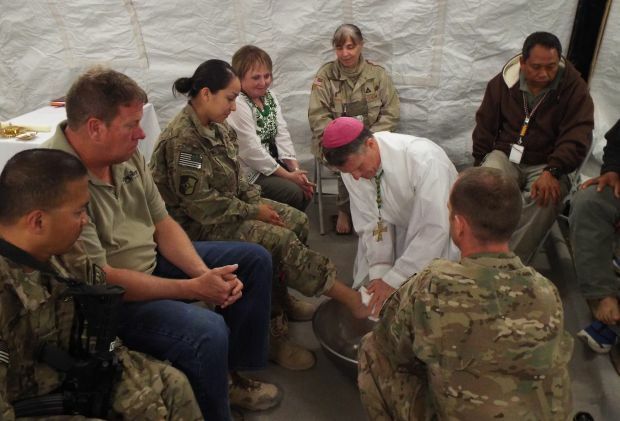 “The visits to many military communities gave me an opportunity to fulfill my role as pastor,” Archbishop Timothy P. Broglio said in an April 24 statement. It was the first trip to Afghanistan by any U.S. military archbishop. His predecessor, then-Archbishop Edwin F. O’Brien, visited troops in Iraq in December 2003. Archbishop Broglio went to Afghanistan April 15-21 at the invitation of Gen. Joseph F. Dunford Jr. of the U.S. Marine Corps, who is commander of the International Security Assistance Force and U.S. Forces Afghanistan. According to a news release from the archdiocese, Archbishop Broglio visited with Catholic servicemen and women still deployed at all eight major U.S. military bases in Afghanistan and in all four regions of the country, which has been at war now for more than 12 years. He also spent time with each of the 13 Catholic military chaplains currently in the country, discussing the issues they face day in and day out, offering his blessings and “encouraging their courageous service,” the release said. Among highlights of his visit, Archbishop Broglio baptized four catechumens joining the Catholic Church at Easter; he confirmed numerous Catholics on deployment. He also installed as lector U.S. Army Maj. Derick D. Bothern, a candidate for the permanent diaconate in the Diocese of Colorado Springs, Colo. He celebrated two Good Friday liturgies, one at Shindand Air Base in Herat province, the other in Kandahar. He celebrated the Easter Vigil at Camp Bastion/Leatherneck in Helmand province. On Easter he celebrated one Mass at headquarters in Kabul, and a second Mass at the Italian Embassy, which houses the only permanent Catholic chapel in the country. Archbishop Broglio met his Italian counterpart, Archbishop Santo Marciano, head of the military ordinariate for Italy. The U.S. archbishop described as “deeply touching” his visit to an orphanage run by the Missionaries of Charity, the congregation founded by Blessed Teresa of Kolkata. The sisters care for care for 11 “exceptional orphaned children,” he said. The Washington-based U.S. Archdiocese for the Military Services, which also has four auxiliary bishops, is responsible for the spiritual, pastoral and sacramental care to those in the United States Armed Forces. This includes more than 220 installations in 29 countries, patients in 153 Veterans Affairs medical centers, and federal employees serving outside the boundaries of the USA in 134 countries. Numerically, the archdiocese is responsible for more than 1.8 million men, women and children. Archbishop O’Brien Came to Camp Arifjan in Kuwait Christmas time 2006. He was very unhappy he was not Given a chopper ride authorization from Gen David Petraeus to Iraq..I Think that was near the surge…Kuwait was very busy with Equipment and Men being convoyed & Flown to Iraq on RTE 80.. or flown from Ali al Salem in Kuwait to Baghdad .. in 2008 Catholic Chaplains Flew on Mondays to from Camp Beuhring Kuwait to Basra & a Penal camp in the south.